Representation of a nanopore in an atom-thick graphene membrane focusing electric field and compressing water inside the pore. 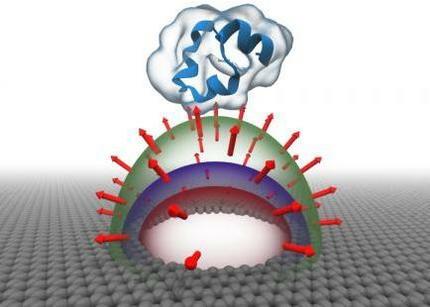 Computer simulations revealed that the compressed water blocks the passage of biomolecules through the pore, without the presence of physical gates. Modern civilization relies on water's incompressibility--it's something we take for granted. Hydraulic systems harness the virtual non-compressibility of fluids like water or oil to multiply mechanical force. Bulldozers, cranes, and other heavy machinery exploit the physics of hydraulics, as do automobile brakes, fire sprinkler systems, and municipal water and waste systems. It takes extraordinary pressure to compress water. Even at the bottom of the deepest oceans, two and a half miles under the surface, where the pressure is equal to about 1000 atmospheres, water is compressed by only 5 percent. But now scientists at the University of Illinois at Urbana-Champaign have predicted new physics governing compression of water under a high-gradient electric field. Physics Professor Aleksei Aksimentiev and his postdoctoral researcher James Wilson found that a high electric field applied to a tiny hole in a graphene membrane would compress the water molecules travelling through the pore by 3 percent. The predicted water compression may eventually prove useful in high-precision filtering of biomolecules for biomedical research. Aksimentiev remarks, "This is an unexpected phenomenon, contrary to what we thought we knew about nanopore transport. It took three years to work out what it was the simulations were showing us. After exploring many potential solutions, the breakthrough came when we realized that we should not assume water is incompressible. Now that we understand what's happening in the computer simulations, we are able to reproduce this phenomenon in theoretical calculations." The scientists undertook this study to test new methods in graphene-nanopore DNA sequencing. Over the last couple of years, graphene nanopores have shown tremendous promise for inexpensive DNA sequencing. The way it works, DNA is suspended in water and then the DNA, water and ions are pulled by an electric field through a tiny hole in a graphene membrane. The electric field applied across the graphene sheet attracts the dissolved ions and any charged particles--DNA is a negatively charged particle. The DNA's four nucleobases are read as the differences in the flow of ions that each distinctively shaped nucleobase produces. In this study, Aksimentiev and Wilson set out to develop a computational model that would allow them to control the speed of transport of DNA through a graphene nanopore. They knew that increasing the applied electric field should increase the speed of transport by the same multiple, but when they increased the field tenfold, the DNA was completely blocked from passing through the hole. Wilson describes what he saw in the simulation: "We were attempting to see if we changed the charge on the graphene sheet, whether that would change the capture rate of the DNA as predicted. Our simulations showed that the DNA goes through the nanopore as expected at lower electric fields, but when you apply 1 volt, the DNA looks like it's dancing above the nanopore--like it wants to go through, but for some reason it can't. Aksimentiev adds, "All of this only works because the membrane is so thin, and the electric field is focused where the membrane is, compressing the water molecule from both sides. The compression is only 3 percent, but that pressurizes the water--it's equivalent to 100 atmospheres--and the pressure basically pushes the DNA back so that it cannot travel through the nanopore." Wilson continues, "Once we worked out what was actually happening is compression of the water, we spoke with experimentalists working with graphene nanopores. We've learned that this phenomenon may already have been observed in the laboratory. Apparently, people have seen it, but they couldn't explain it. The experiments will need to be repeated to validate our theory." Aksimentiev concludes, "We had originally set out to use this work for DNA sequencing. But now we think we can use it for identifying and separating biomolecules that are very similar but have some small difference. For example, you could have many of the same protein, but some might carry one very small mark--one posttranslational modification--that alters its charge. That difference of just one electron would determine whether the molecule passes through the nanopore or not, because that's a function of charge. So we could potentially use this new phenomenon of water compression to very precisely filter biomolecules."